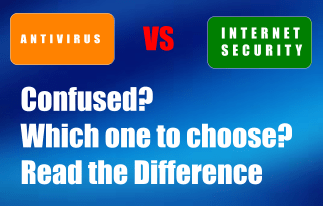 (Compare) Antivirus Vs Internet Security. Which one to choose? Many people get confused between antivirus and Internet Security product. Which one is better or which one to choose? antivirus or Internet Security. Here I have tried to mention Antivirus and Internet Security differences. It can help you to choose the best Antivirus or Internet Security. It is a standalone antivirus program. These days some companies also include Anti-malware and some other basic security features in it. It is a collection of many features including antivirus like Firewall, Antimalware, Antispyware, AntiSpam etc. Can be useful for Basic protection for home users. Useful for Business users and serious home users to protect data. Anti virus can only scans the virus that it knows. It cannot prevent any virus it does not recognize. So Anti-virus software just fights Viruses, Worms and Trojans they have signatures for and just provides a basic protection. But because as technologies grows method of cyber crime also get advanced and bad people uses many other methods to do the bad things with computer users. Though these days many antivirus software providers are using cloud based and behavioral protection system to make the antiviruses more powerful. But still there is one thing that mostly all provider miss in their antivirus is Firewall. Firewall works greatly to protect the device from hackers etc. Internet Security includes and provide defense against many threats and keep the computer secure even from hackers. It is not just one program, but is usually composed more than one application that aims to provide total protection towards the user. Still at its core is certainly an anti-virus program. But aside from an anti-virus program, another programs inside the suite provide more peace of mind in the potential risks that came into being along with the web age. It includes the another application that’s essential in a web-based security suite is a firewall. A firewall limits others on the internet from getting utilization of your computer or network by decreasing connection demands .Internet Security Suite could safeguard you from spyware and adware programs that could send your own personal together with additional information to organizations outdoors and other sorts of malware and spy ware. Many antivirus companies are providing even more features in a Internet Security suite these days. Like Multiple layer of protection, two way firewall, Wi Fi and Network Protection, System Cleaner, Parental Control, Community based protection, Social Network Protection etc. Different Software provider have different features in their particular product, So choose wisely and read and compare all the features carefully before making your decision to buy an antivirus or Internet Security Program. So just only antivirus is not enough to keep your computer safe & secure. You need a Internet Security Software. Always buy a total internet protection or Internet Security suite to keep your computer safe & Secure. Although it costs you a little more but it would give you a complete peace of mind. Other useful related links which can help you to choose the best Antivirus for you. Best Free Antivirus for Windows 10. Best paid Antivirus for Windows 10. You can check here latest deals or Discount Coupons codes to get Cheap Internet Security software. Differences between internet security and antivirus, Can you please tell me the differences between internet security and antivirus ? What do you mean by web protection ? I explain it about web protection feature of internet security, actually web protection works when you go to any suspected websites and they trying to attack on your computer and trying to enter into your computer, then the web protection option will block that types of attacks on gate of webpage. there is not feature in antivirus. Differences between internet security and total security , Can you please tell me the differences between internet security and total security ? which is the best security software 2014? please help me…. Internet security and total security are almost the same thing. Even total security is the better than Internet Security. The total security have all the security option to protect your computer. which is the best between Trend Micro – Titanium Maximum Security, Trend Micro Titanium Antivirus, Quick Heal Total Security & Bitdefender Antivirus Plus OR other (specific model name, ex – trend micro internet security or trend micro maximum security).. please tell me hurry …. Bitdefender Internet Security is the best one from them. Can you please suggest the best total security softwares for use with Windows 7? We recommend you NORTON Internet Security / 360. Norton product is really very good. 1.if i use an internet security will my system slow down ? 2.if it doesnt which one do u think is the best antivirus protector for windows 8.1? I was told to download Avast security for more security. I already have Kaperskys internet security downloaded..then advised NOT to do it as one will fight with the other one?? Sure, you have to uninstall one of them. i have bitdefender internet security and i want to add bitdefender total security to it (both running on the same pc). is it ok ? and does that slow down my pc ? No, two antiviruses should not be run on a computer. So, you have to remove one. You should keep Total security, it have internet security features as well. Remove Bitdefender Internet Security. Guyz! I would recommend you all to go with quick heal internet security/total security..!! because since 7 years I haven’t got any security software that clears viruses properly from removable storage i.e. USB Pendrive or Memory card with out deleting/affecting the data but finally got quick heal security..!! So i can scan for viruses without tension of data lost..! 🙂 Whats say Techexpert! Which is the best between Quick heal antivirus pro & bit difender antivirus plus ???? I am a technician also. I want to join with you. What is the difference between internet security 2014 & internet security 2015. ? About what company’s are you talking about. If there is not any company it may be some fake antivirus. And if you are talking generally about all companies then the answer is that every company have their own mind and added new features in new version varies from company to company. You have the check the details about that. I have Kaspersky anti virus but they have a total internet security software. And don’t want to have both I’m using the Kaspersky antivirus trial and it does pretty good for the most part but which should I have ? Internet Security is batter than Antivirus. Because Internet Security have internet protections with antivirus feature.